Frenchman Robert Simac, in the ex-Jean-Pierre Jaussaud March 712, has extended his winning sequence in the HSCC Historic Formula 2 FIA-sanctioned International Series to five seasons after being confirmed winner of the 2017 Jochen Rindt Trophy for 1600cc cars. Simac cannot be beaten over the final two races next month at his home track of Dijon, having done enough at the recent Oulton Park Gold Cup, and plans to defend his title next season but has shelved plans to move up to a 2-litre car. The remaining three titles in the series will only be decided during the final race weekend of the season at Dijon on 7/8 October. In the Gilles Villeneuve Trophy for 1600cc Formula B and Formula Atlantic cars, Frenchman Olivier Huez (March 722) is in the lead, while Stephen Weller (Elfin 600B) looks set to clinch the Jim Clark Trophy for early non-winged F2, Formula B and Formula Atlantic cars. 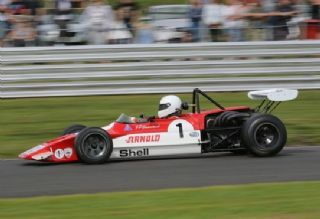 However, the contest for the Bruno Giacomelli Trophy for 2-litre F2 cars from up to 1978 remains open, the current leader is Richard Evans (March 742).